i’d played through mighty switch force! early last year and had enjoyed it, although the central premise (using a button to switch blocks from the foreground to the background, and vice versa) didn’t really hold my attention. it was the first game i’d completed by wayforward technologies, and although the gameplay itself wasn’t my favorite, the stylish presentation, including great music, character design, and smooth controls, was enough to keep me playing through to the end. at first it felt like its predecessor mighty flip champs! was going to end up falling around the same place in my esteem. the game’s central premise is that you press a button to switch the bottom screen to the top screen, and the game is perhaps even more polished than MSF, despite (or because of) it having simpler pixel graphics. the character design is great, as is the music and general colorful art style. the presentation in general has a nintendo 1st-party game-like vibe, which in my book is a very high compliment indeed. despite the sky-high level of polish, the gameplay was slow to grab me. the review at nintendolife covers the mechanics and is typically complimentary, but i found the puzzle aspect to be fairly tame and somewhat obvious and just a matter of navigating a maze that shuffles around. after playing for a while, though, the game’s mechanics became much more enjoyable, and i really appreciated how beautifully the game makes use of the second screen of the DS. i’d go so far to say that it makes one of the most unique and essential uses of the DS’s second screen of all of that system’s (and its similarly two-screened successors’) library (although it has since been re-released on other platforms with the second screen flipped horizontally to the right instead of vertically in order to fit single-screen devices). this shift in my enjoyment was due in no small part to the trickier levels that appear later in the game, around worlds 3 and 4 (of 5). many of the other levels have a single route that’s very obvious, i.e. at any single point there’s only one place you can go in order to safely flip from the current to next screen). those levels remind me a lot of the highest-ranked user-created levels in games like mario vs. donkey kong: minis march again! where instead of being a puzzle the level is really just a rube-goldberg like contraption that the player just has to set in motion. but there are some levels where you can see where you’re supposed to go but it takes some head-scratching to figure out how to get there (being able to mark a spot on the screen with the stylus is a huge help in some of these stages). 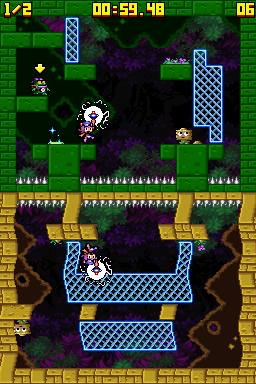 it’s admirable how much gameplay wayforward was able to squeeze into these single-screen levels, and a higher percentage of truly puzzling levels (as opposed to just following the single path laid out by the level designer) would have really helped. as it is some people have complained that the game is too difficult, so i guess you can’t win ’em all. personally i thought the difficulty curve was fine, and since the game has such a limited amount of actions you can perform overall even younger players shouldn’t have much trouble completing it with enough patience. overall i would agree with the general opinion that mighty flip champs! is one of the highlights of DSiware, even though it was one of the earliest releases for the system. wayforward has steadily built up a library of great games and i’m looking forward to playing the third of their mighty trilogy, as well as trying out their other acclaimed titles.